Normally you wouldn’t expect a 35-year-old movie intended to be a drive-in B movie slasher to engender the kind of fans that warranted two sequels and now, a full fledged TV series, “Ash vs. Evil Dead” (Starz, 9 p.m.). But that was before “The Walking Dead.” And though the popularity of that zombie saga comes despite its dour storytelling and nonstop violence, the new series succeeds with dark humor nearly as plentiful as its blood. 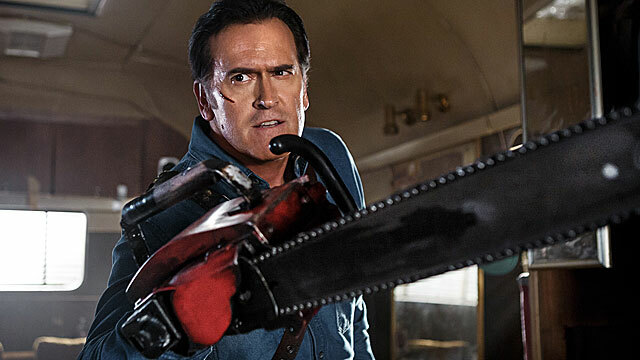 In it, Bruce Campbell reprises his role as boorish and reluctant monster hunter Ash Williams, back on the case after he accidentally reawakens the evil he thought he had vanquished decades earlier. Original filmmakers Sam Raimi and Rob Tapert are back as well, in addition to a colorful cast of sidekicks and personalities that includes Lucy Lawless. Raimi, director of the original and executive producer of the new series (who also directed the first episode) concurs. “It’s really important that we fulfill our obligations to the fans who’ve asked us to make this either as a movie or a series,” he says. “But they have certain expectations. Because after three feature films and, like Bruce said, 35 years of fans following, they want particular things. And so it was very important we found a network that was willing to go to the limit, really let us go anywhere we wanted with the humor, anywhere, outrageous horror, crazy amounts of gore, which is some of the hallmarks of the ‘Evil Dead’ films, because we had an obligation to the fans. The goals of “The Evil Dead” when it was conceived, was very modest, Raimi said. Raimi, who went on to make three “Spider-Man” movies, is astonished how the original horror movie held up for generations. “There are kids who are now being introduced to it by their parents, and there are parents that just grew up with the thing, all the movies. So they’ve done the work of showing their kids the movies — if you want to call that work. Or poor parenting. It’s hard to say. But they’ve shown these kids, and the kids now are fans. “And we’ve just kept our own expectations as to what we thought made a great horror movie, what the audience liked in the others ones, trying to keep that in mind while making it new. That’s what guided us for this series,” he says. Plus, it’s only a half hour. Plus, says the irrepressible Campbell, being on Starz means “you’re not cutting away to Chevy commercials. It affects the structure of TV shows, and I don’t know how many people really understand this. ‘Dun, dun, dun. Your father’s the murderer.’ They have to put that crap in at the end of each act to get you back after the Chevy commercial. Now you just tell the story. Starz is happy enough with the series that it’s already ordered a second season, days before the first one started.